Is the tobacco industry highjacking the SDGs? The idea of business involvement in the Sustainable Development Goals (SDGs) is trending, but so far there has been little systematic analysis: How are corporations engaging in the SDGs? What kind of engagement is desirable and where are the limitations? 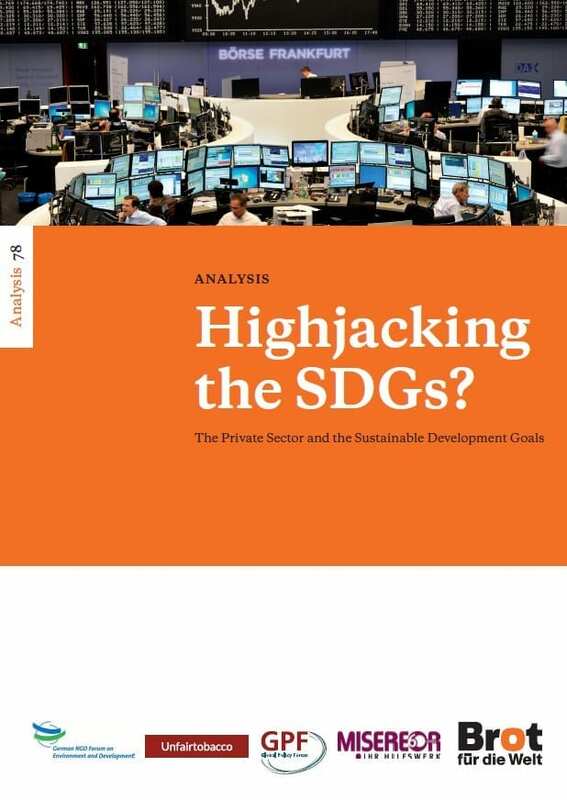 The newly published analysis “Highjacking the SDGs? The Private Sector and the Sustainable Development Goals” provides a starting point for a debate on business and sustainable development. The paper was released during a public event on 4 July 2018 in Berlin by the German NGO Forum on Environment and Development, Global Policy Forum, Misereor, Bread for the World and Unfairtobacco. Interestingly, tobacco corporations belong to the early adopters of SDG rhetoric. That is why the paper features a case study on the tobacco industry that exposes how cigarette corporations use the SDGs in a broad strategy to circumvent regulation, written by our policy advisor Laura Graen. Mentioned explicitly in SDG 3 (health), the regulation of the tobacco industry is part of the 2030 agenda. For good reason, considering the fact that 7 million people die each year as a result of addictive tobacco products. Tobacco related diseases are the leading preventable cause of death from non-communicable diseases (NCDs). Cutting global tobacco prevalence would therefore significantly contribute to the goal of one third reduction of premature mortality caused by NCDs, as stipulated in SDG 3.4. Additionally, tobacco control is relevant for the achievement of sustainable development far beyond public health. It can help to eradicate poverty and hunger, reduces workplace-related injuries and diseases (second-hand smoke at work is responsible for 433,000 deaths each year, globally), contributes to education, protects the environment and it can provide billions of dollars through tobacco taxes to fund development. Internal industry documents show that tobacco corporations have known for decades that they are selling a product that kills when used as intended, while reassuring governments and the public about the safety of cigarettes. Contrary to the companies’ claims to only market to adults who already smoke, in its need for “replacement smokers”, the industry targets children and youth with advertising campaigns. For decades, the tobacco industry has undermined the tobacco control efforts of the World Health Organization (WHO) and governments worldwide, using manipulated science, overt and subvert lobbying, front groups, Corporate Social Responsibility (CSR) projects, as well as threats and legal action in national courts and investor-state dispute settlement tribunals. Learning from the experience that the tobacco industry makes huge efforts to delay or water down regulation, the WHO tobacco control treaty FCTC – whose implementation is part of SDG 3 – contains a provision that restricts the interaction between industry actors and public institutions to the amount strictly necessary for regulation and condems CSR projects and partnerships with the tobacco industry. The case study shows how tobacco companies engage in the SDGs and how they use them as a smokescreen for old strategies. On a rhetorical level, all four multinational tobacco companies support the SDGs. Imperial Brands mentions them in its 2017 annual report to investors, announcing a review of the company’s CSR programs in view of the SDGs. British American Tobacco’s Chief Executive Officer Nicandro Durante sees “a clear alignment between the SDGs and our own sustainability priorities”. Japan Tobacco International even used the SDGs to attack the WHO. And in a press release, Philip Morris International welcomes the SDGs, without mentioning that the tobacco control treaty FCTC that the corporation fights with whatever means available, is part of the goals. Besides rhetoric and CSR projects, the question remains: Does the tobacco industry change its core business strategies? As a matter of fact, their biggest impact on sustainable development lies in public health. While the four multinationals have started to admit the “health concerns associated with smoking”, usually in tandem with praise for e-cigarettes or heated tobacco products (that are not proven to be nonhazardous), they continue to fail to admit the responsibility for millions of deaths in the past, present and future in which they keep on selling cigarettes. In fact, they do not only continue to sell combustible tobacco products, on which they spend the lion’s share of their promotional budgets, but also geographically expand and scale their markets for them. In a comprehensive introduction chapter, written by Marie-Luise Abshagen of German NGO Forum on Environment and Development and Anna Cavazzini of Bread for the World, the analysis discusses corporate engagement in the SDGs processes in general and gives recommendations for companies, policy makers and civil society. It also includes a case study on the finance sector, written by Wolfgang Obenland of Global Policy Forum that discusses potential sources of funding for sustainable development (for example green bonds or SDG bonds) and the shortfalls of an under-regulated banking and finance sector. This is only a summary of the paper. For the deeper analysis and sources, please download or order it here (free). The biggest impact the tobacco industry can have on the achievement of the SDGs is the immediate cessation of all marketing efforts for cigarettes and other harmful tobacco products, and subsequently the stop of manufacture and sale of these products. But they just continue with their old strategies. This has nothing to do with sustainable development, except for sustainable development of corporate profits. PMI Leaks: The truth behind the "smokefree future"
While Philip Morris International (PMI) publicly offers the world a smokefree future the corporation works hard in secrecy to hinder public health policies.